My memories of visiting Cambodia are probably typical of most tourists’: photographing the majestic spires of Angkor Wat, perusing books and DVDs about the Khmer Rouge at various street stalls, sampling amok and other delicacies wrapped in banana leaves. But it wasn’t the world’s largest religious building, or Cambodia’s traumatic history, or even the culinary delights that drew me to this Southeast Asian country of 15 million people. I was compelled to spend the summer of 2009 in Cambodia after meeting Reverend Beth Kanji Goldring, an American Zen Buddhist priest, former ballet dancer and university humanities teacher, and founder of Brahmavihara/Cambodia AIDS Project, a Buddhist chaplaincy organization based in Phnom Penh. In a Theravadan Buddhist country where orange-robed monks and white-robed nuns are ubiquitous, Beth is an unexpected sight. A sixty-six-year-old woman with a shaved head, wearing a Khmer-style white shirt and black pants, Beth is always quick to offer a blazing smile and warm embrace. She works with a team of ten Cambodians to care for more than 400 AIDS patients in hospitals, homes, prisons and resettlement sites. Numbers, though, don’t capture the essence of Brahmavihara’s chaplaincy work, which has been funded solely by dana—freely given assistance, mostly by individuals—since its inception in 2000. In the Maryknoll hospice, Kunthea is dying from cancer in addition to her AIDS. Souen, our staff member and Kunthea’s old friend, has been visiting virtually every day. Today, my translator Ramo and I stop in to see Kunthea before Souen gets there. Kunthea is crying. Her diaper, loose because her legs and buttocks are sticks, is leaking, and someone has said something unkind to her. We clean her up, saying calming words. I try to do some Reiki with her stomach, hugely swollen from the tumor, but the tissue is utterly unresponsive and Kunthea is restless, not able to stay in one position even for a full minute. Ramo and I do what we can until Souen arrives and climbs into bed with Kunthea. 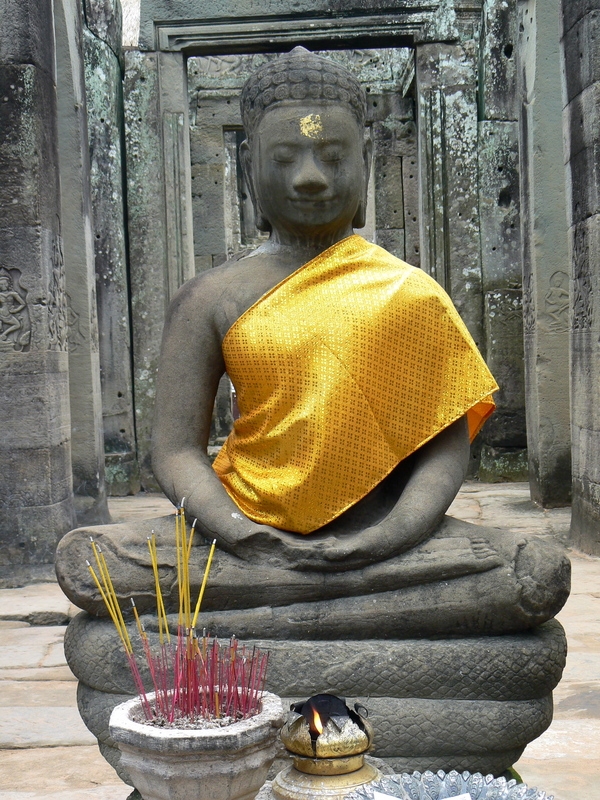 When we return after a meeting, we find Souen sitting by Kunthea’s head, softly chanting the Buddhist precepts to her. A tremendous peacefulness fills the room and emanates from it. Later, Ramo tells me that it was impossible to know when Kunthea passed from sleep into death. He and Souen, both of them fully attentive to her, became aware when she had gone, but did not know when she stopped breathing. The transition was seamless. It is tempting to regard Beth Goldring and the rest of the Brahmavihara staff as bodhisattvas for the unwavering compassion they bring to their work with the sick and dying. But in spite of being one of twenty recipients worldwide for the Outstanding Women in Buddhism Award in 2008, Beth, with characteristic modesty and humor, makes it clear that she has no interest in “claiming some kind of weird status.” Beth is the first to acknowledge the ways grief, anger and despair create barriers in her work, so it doesn’t surprise me that she is loathe to consider herself some kind of saint or enlightened being. But Brahmavihara surely embodies, in aspiration and in practice, the bodhisattva ideal of working for the sake of all beings on the path to awakening. Every day during meditation and chanting, when offering Reiki, massage, food, and kind words to patients or while sitting their annual ten-day vipassana retreat, the staff demonstrate their deep concern about the suffering of others and their intention to find liberation for themselves. This is a life of unwavering commitment through the most challenging circumstances of sorrow, difficulty and frustration. Although Brahmavihara often works with the poorest of the poor—with people who have been rejected by their families and neglected by the government—I never witnessed any condescension in the staff’s interactions with patients. On the contrary, I was astounded by the depth of intimacy and love that the staff had for the patients. I suspect this is partly due to the fact that the majority of Brahmavihara’s staff are HIV-positive; many have experienced poverty and the death of loved ones; some have even found themselves on the brink of death. I suspect a sense of interconnectedness between patients and staff facilitates the development of intimacy and trust. Brahmavihara is Buddhist pastoral theology in action. As Beth discovered early on, attempting to teach patients to meditate only made them more tired and exhausted, outweighing any benefit they received. In lieu of formal instructions on breath meditation, the staff now offers Reiki to help patients effortlessly enter a meditative state. Reiki, developed in 1922 by Japanese Buddhist Mikao Usui, uses a technique called palm healing that transfers healing energy through the hands. Beth often comments on how much patients love this “meditation with the hands” and how peaceful they become. Chanting and giving precepts offers Cambodians familiar forms and rituals, which provide a sense of safety for patients and families. For Beth, this patient’s suffering was at odds with her understanding of the Dharma, particularly with her belief that the Buddha’s compassion is available to everyone without discrimination, regardless of external circumstances. This compassion comes up again and again in Beth’s descriptions of Brahmavihara’s core purpose: “Every bit of our work is directed toward helping people realize that the Buddha’s compassion is already fully present, even and especially in the midst of their suffering.” It is clear from the staff’s ability to work without the burnout seen in so many “helping professions” that they are as much recipients of this sustaining compassion as they are agents of it. Perhaps the main reason that the staff does not burn out is explained by how they relate to their chaplaincy work. I have never heard Beth talk about “helping” patients. Instead, she speaks of “practice” with patients, and “training” in the development of character and insight. As vipassana teacher Gil Fronsdal says to Beth: “Brahmavihara is your monastery.” After all, the Brahma-viharas, or divine abodes (lovingkindness, compassion, sympathetic joy, and equanimity), are virtues that can be cultivated endlessly. Thus, Brahmavihara’s “work” is never separate from spiritual practice. At the end of the 2009 yearly vipassana retreat, Beth spoke to all of us with a broad smile: “I know that all your feet are firmly on the path now.” In that moment, I thought of the bodhisattva vow to forestall one’s own enlightenment until all beings have completely awakened. Beth often signs her e-mails “huge love,” and this is exactly the sense I had in that meditation hall in rural Cambodia, surrounded by exemplars of compassion who have not a shred of pretension about the extraordinary work—practice—they do. To find out more about Brahmavihara, visit www.brahmavihara.cambodiaaidsproject.org. Chenxing Han holds MA in Buddhist studies and Buddhist chaplaincy from the Graduate Theological Union and Institute of Buddhist Studies in Berkeley, California. She and her partner, Trent Walker, live in Berkeley, California.